Sverchok is a super-exciting add-on for Blender that allows for parametric model creation, much like Rhino's Grasshopper. Developer nikitron presents the latest update and offers a Q&A session today on Google Hangout. Sverchok - is parametric tool for architect, designer, lets you to programming form without knowing programing longuages. You have opportunity to ask questions to developers at this friday at 18-00 GMT. In G+ will occur hangout presentation. You could be able to download and try this addon. Ask questions, watch it in workflow and feel the magic of OpenGL and visual programming. Developers, who interested in Sverchok could be able to deal with us through github. Those who familiar with Houdini or Rhinoceros 3D might know the visual scripting language (Grasshopper), which Sverchok has been inspired by. 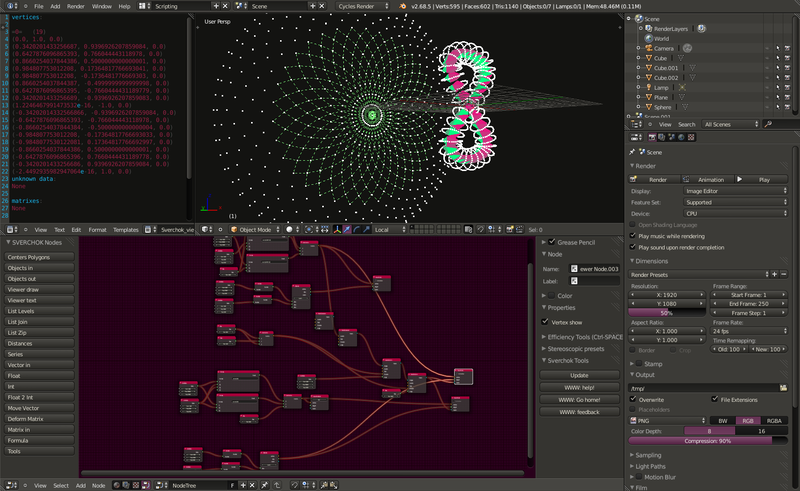 Using a similar node based visual programming principle, Ukrainian/Russian artists Nikita and Alexander trying to bring this functionality to Blender users. For now it is 19 nodes ready to work. So, meet the 0.2.0 version! Completely rebuilded. Downloading now. Will definitely give this a try. Thanks for your development! Sounds like it will come in handy, especially for motion graphics work! Whoop! Sorry about that, I've updated the post. Wow, guys! This is another cool start in Blender! Really hope your efforts will be transformed into a very useful system to model generated forms and structures! I guess it will be much faster in C. Wooooohooooo!!! This sounds awesome!! I'll have to try it when I get home from work. I'm really hoping that this is what the mographers out there have been waiting for! I had no clue that you could do these kind of things in Blender. Is this done with the new pynodes? Pynodes is something different, but we will make it compatible, import-export nodes, universal nodes will be implemented, so you may put from pynodes to Sverchok and vice versa. Pynodes makes other things, not so virtual, as we do. Sorry for hangout limit. I didn't know of this linits, Google allows to invite thousands of people, but only ten can be handled with hangout. Thanks for thouse who participated and sorry for this google restrictions. Thanks guys, this is a really interesting project!! I'll probably get in touch with some questions if you don't mind ;) I'd love to use nodes in a project of mine as well! Previous ArticleMeet the Blender Developers!